The history of Nintendo traces back to 1889, when it was founded to produce handmade hanafuda. Nintendo Co., Ltd. (任天堂株式会社, Nintendō kabushikigaisha) is a Japanese multinational consumer electronics company headquartered in Kyoto, Japan. It eventually became one of the most prominent figures in today's video game industry, being the world's largest video game company by revenue. Nintendo started out as a small Japanese company, founded by Fusajiro Yamauchi on September 23, 1889, as Nintendo Koppai. Based in Kyoto, Japan, the business produced and marketed hanafuda. The name "Nintendo" is commonly assumed to mean "leave luck to heaven", but there are no historical records to validate this assumption. The cards, which were all handmade, soon began to gain in popularity, and Yamauchi had to hire assistants to mass-produce cards to keep up with the demand. Fusajiro Yamauchi did not have a son to take over the family business. Following common Japanese tradition, he adopted his son-in-law, Sekiryo Yamauchi, (after the wife). In 1929, Yamauchi retired from the company and allowed Sekiryo Yamauchi to take over the company as president. In 1933, Sekiryo Yamauchi established a joint venture with another company and renamed the company Yamauchi Nintendo & Co. In 1947, Sekiryo established a distribution company, Marufuku Co., Ltd., to distribute the hanafuda, as well as several other brands of cards that had been introduced by Nintendo. Sekiryo Yamauchi also had only daughters, so again his son-in-law (Shikanojo Inaba, renamed Shikanojo Yamauchi) was adopted into the family. Shikanojo never became president because he abandoned his family. Subsequently, his son Hiroshi was brought up by his grandparents. He later took over the company instead of his father. In 1949, Hiroshi Yamauchi was attending Waseda University in Tokyo, however, after his grandfather died he left to take office as the president of Nintendo. 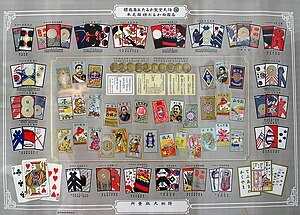 In 1951, he renamed "Marufuku Co. Ltd." to "Nintendo Playing Card Co., Ltd." In 1953, Nintendo became the first company in Japan to produce playing cards from plastic. In 1956, Yamauchi visited the U.S., to engage in talks with the United States Playing Card Company, the dominant playing card manufacturer in the United States. He was shocked to find that the world's biggest company in his business was relegated to using a small office. This was a turning point for Yamauchi, who then realized the limitations of the playing card business. In 1959, Nintendo struck a deal with Disney to allow the use Disney's characters on Nintendo's playing cards. Previously, Western playing cards were regarded as something similar to hanafuda and mahjong: a device for gambling. By tying playing cards to Disney and selling books explaining the different games one could play with the cards, Nintendo could sell the product to Japanese households. The tie-in was a success and the company sold at least 600,000 card packs in a single year. Due to this success, in 1962, Yamauchi took Nintendo public, listing the company in Osaka Stock Exchange Second division. Following the aforementioned success, in 1963 Nintendo Playing Card Co., Ltd. was renamed to Nintendo by Yamauchi. Nintendo now began to experiment in other areas of business using the newly injected capital. During the period of time between 1963 and 1968, Nintendo set up a taxi company, "love hotel" chain, food company (trying to sell instant rice, similar to instant noodles) and several other things (including a vacuum cleaner, Chiritory, which later appeared in a two-player minigame in WarioWare, Inc.: Mega Microgame$ in 2003). All these ventures eventually failed, except toymaking, where they had some earlier experience from selling playing cards. In 1964, while Japan was experiencing an economic boom due to the Tokyo Olympics, the playing card business reached its saturation point. Japanese households stopped buying playing cards, and the price of Nintendo stock fell from 900 yen to 60 yen. In 1965, Nintendo hired Gunpei Yokoi as a maintenance engineer for the assembly line. However, Yokoi soon became famous for much more than his ability to repair conveyor belts. Nintendo struggled to survive in the Japanese toy industry; it was still small at this point, and dominated by already well-established companies such as Bandai and Tomy. Because of the generally short product life cycle of toys, the company always had to come up with new products. This was the beginning of a major new era for Nintendo. In 1966, Yamauchi was observing a hanafuda factory. He noticed an extending arm, which was made by one of their maintenance engineers, Gunpei Yokoi, for his own amusement. Yamauchi ordered Yokoi to develop it as a proper product for the Christmas rush. Released as the "Ultra Hand", it would become one of Nintendo's earliest toy blockbusters, selling over a million units. Seeing that Yokoi had promise, Yamauchi pulled him off assembly line work. Yokoi was soon moved from maintenance duty to product development. Due to his electrical engineering background, it soon become apparent that Yokoi was quite adept at developing electronic toys. These devices had a much higher novelty value than traditional toys, allowing Nintendo to charge a higher price margin for each product. Yokoi went on to develop many other toys, including the Ten Billion Barrel puzzle, a baseball throwing machine called the Ultra Machine, and a Love Tester. Another invention of his, in collaboration with Masayuki Uemura from Sharp, was the Nintendo Beam Gun Game, the precursor to the NES Zapper (which was used in games like Duck Hunt.). Nintendo released the first solar-powered light gun, the Nintendo Beam Gun, in 1970; this was the first commercially available light-gun for home use, produced in partnership with Sharp. In 1972, Nintendo released the Ele-Conga, one of the first programmable drum machines. It could play pre-programmed rhythms from disc-shaped punch cards, which could be altered or programmed by the user, to play different patterns. In 1972, the first commercially available video game console, the Magnavox Odyssey, had a light gun accessory, the Shooting Gallery. This was the first involvement of Nintendo in video games. According to Martin Picard in the International Journal of Computer Game Research: "in 1971, Nintendo had -- even before the marketing of the first home console in the United States -- an alliance with the American pioneer Magnavox to develop and produce optoelectronic guns for the Odyssey (released in 1972), since it was similar to what Nintendo was able to offer in the Japanese toy market in 1970s". In 1973, its focus shifted to family entertainment venues with the Laser Clay Shooting System, using the same light gun technology used in Nintendo's Kousenjuu series of toys, and set up in abandoned bowling alleys. Following some success, Nintendo developed several more light gun machines for the emerging arcade scene. While the Laser Clay Shooting System ranges had to be shut down following excessive costs, Nintendo had found a new market. In 1974, Nintendo secured the rights to distribute the Magnavox Odyssey video game console in Japan. Nintendo at this time saw how successful video games were and began to dabble in them. Their first step in that field was to secure the rights to distribute the Magnavox Odyssey in Japan in 1975. At the time, home video game consoles were extremely rare—even the seminal like theAtari Pong consoles had yet to be produced. After experiencing reasonable success at this, Nintendo began developing its own video games, both for home and for arcades. In the 1970s, Mitsubishi Electric proposed joint development of "Color TV Game Machine". In 1977, they released "Color TV Game 6" and "Color TV Game 15" (6 and 15 indicates the number of games). Their first video arcade game was 1975's EVR Race; a handful of others followed in the next several years, Radar Scope and Donkey Kong being among the most famous of these. The early 1980s saw Nintendo's video game division (led by Yokoi) creating some of its most famous arcade titles. The massively popular Donkey Kong was created in 1981, with Shigeru Miyamoto as its mastermind, and released in the arcades and on the Atari 2600, Intellivision, and ColecoVision video game systems (although Nintendo themselves generally had no involvement with these early console ports). This release method would be used on several later Nintendo arcade games of this same period, including the original Mario Bros. (not to be confused with the later Super Mario Bros.) In addition to this arcade and dedicated console game activity, Nintendo was testing the consumer handheld video game waters with the Game & Watch. Game & Watch or G&W is a line of handheld electronic games produced by Nintendo from 1980 to 1991. Created by game designer Gunpei Yokoi, each Game & Watch features a single game to be played on an LCD screen in addition to a clock and/or an alarm. It was the earliest Nintendo product to garner major success, with 43.4 million units sold worldwide. In 1982, Nintendo developed a prototype system dubbed the "Advanced Video System" (or AVS for short) and had controllers much like the NES. There were accessories such as a tape drive, a joystick and a lightgun, and along with all of that, the system was made of a computer, much like the Atari 400, Commodore Vic-20 and Commodore 64. It was never released and is on display at the Nintendo World Store in New York. In July 1983, Nintendo released the Famicom (Family Computer) system in Japan, which was its first attempt at a cartridge-based video game console. The system sold over 500,000 units within two months at a price around $100 USD. However, after a few months of favorable sales, Nintendo received complaints that some Famicom consoles would freeze when the player attempted to play certain games. The fault was found in a malfunctioning chip and Nintendo decided to recall all Famicom units that were currently on store shelves, which ultimately cost them approximately half a million USD. During this period, Nintendo rekindled their desire to release the Famicom (Or Nintendo Entertainment System) in the US. Since the company had very little experience with the US market, they had previously attempted to contract with Atari for the system's distribution in 1983. However, a fiasco involving Coleco and Donkey Kong soured the relationship between the two during the negotiations, and Atari refused to back Nintendo's console. In 1983-1985, a large scale recession in video game sales hit the market which amounted to a 97% decrease primarily in the North American area. The recession known as the "video game crash of 1983" was caused by a few main factors including the flooding of the console market, competition of home computers, inflation, and loss of publishing control. The video game crash of 1983 soon took out not only Atari, but the vast majority of the American market itself. Over time, dominance in the market shifted from America to Japan. Nintendo began exporting to America and had virtually only one major competitor in the market, Sega, which was another Japanese company. Nintendo was determined not to make the same mistakes in the US that Atari had. Because of massive influxes of games that were regarded as some of the worst ever created, gaming had almost completely died out in America. Nintendo decided that to avoid facing the same problems, they would only allow games that received their "Seal of Quality" to be sold for the Famicom. In 1985, Nintendo announced that they were releasing the Famicom (Family Computer) worldwide with a different design under the name the Nintendo Entertainment System (NES). They used a creative tactic to counter the bad view that the media was giving on video games, and released the NES with R.O.B. units that connected to the console and were synchronised to the games. To ensure the localization of the highest-quality games by third-party developers, Nintendo of America limited the number of game titles third-party developers could release in a single year to five. Konami, the first third-party company that was allowed to make cartridges for the Famicom, would later circumvent this rule by creating a spinoff company, Ultra Games, to release additional games in a single year. Other manufacturers soon employed the same tactic. Also in 1985, Super Mario Bros. was released for the Famicom in Japan and became a large success. Nintendo test marketed the Nintendo Entertainment System in the New York area on October 18, 1985. They expanded the test to Los Angeles in February 1986, followed by tests in Chicago and San Francisco. They would go national by the end of 1986, along with 15 games, sold separately. In the US and Canada, it outsold its competitors by a wide margin. This was also the year that Metroid and Super Mario Bros. 2 (the Japanese version) were released. In 1987, The Legend of Zelda was released to much critical acclaim. In 1988, Nintendo of America unveiled Nintendo Power, a monthly news and strategy magazine from Nintendo that served to advertise new games. The first issue published was the July/August edition, which spotlighted the NES game Super Mario Bros. 2. Nintendo Power has since ceased publication with its December 2012 edition. In 1989, Nintendo (which had seen a large amount of success from the Game & Watch) released the Game Boy (both created by Gunpei Yokoi), along with the accompanying game Tetris. Due to the price, the game and its durability (unlike the prior Microvision from Milton Bradley Company, which was prone to static and screen rot), the Game Boy line sold extremely well, eventually amassing sales of 118 million units. Later, Super Mario Land was also released for the Game Boy, which sold 14 million copies worldwide. 1989 was also the year that Nintendo announced a sequel to the Famicom, to be called the Super Famicom. The last major first-party game for the NES, Super Mario Bros. 3, was released in early 1990, and went on to sell over 18 million units. It was followed by a licensed television adaption named The Super Mario Bros. Super Show!, which was released by DIC Entertainment and Viacom Enterprises in that year to capitalise on the game's immense popularity. The Super Famicom was released in Japan on November 21, 1990. The system's launch was widely successful, and the Super Famicom was sold out across Japan within three days, selling 1.6 million units by June 1991. In August 1991, the Super Famicom was launched in the US under the name "Super Nintendo Entertainment System" (SNES), followed by Europe in 1992. The Super Nintendo Entertainment System followed in the steps of its predecessor, with high technical specifications for its era. The controller of the SNES had also improved over that of the NES, as it now had rounded edges and four new buttons, a standard which is evident on many modern controllers today. Nintendo had also begun development on a CD-ROM attachment for the SNES/Super Famicom. Their first partner in this project was Sony, whom Nintendo had worked with before to provide the SNES with its SPC sound chip. Development on the Nintendo PlayStation CD-ROM add-on and SNES/SFC standalone hybrid console began. However, at the last minute Nintendo decided to pull out of the partnership and instead go with Philips, and while no CD-ROM add-on was produced, several Nintendo properties (namely The Legend of Zelda) appeared on the Philips CD-i media console. Upon learning this, Sony decided to continue developing the technology they had into the PlayStation. The exact reason Nintendo left its partnership with Sony has been the subject of speculation over the years, but the most common theory is that Sony either wanted too much of the profits for the machine or the rights to the CD-ROM attachment itself. In Japan, the Super Famicom easily took control of the gaming market. In the US, due to a late start and an aggressive marketing campaign by Sega (Headed by the Sega Company's new mascot, Sonic The Hedgehog, their answer to Nintendo's Super Mario), Nintendo saw its market share take a precipitous plunge from 90-95% with the NES to a low of approximately 35% against the Sega Genesis. Over the course of several years, the SNES in North America eventually overtook the Genesis, thanks to franchise titles such as Super Mario World, The Legend of Zelda: A Link to the Past, Street Fighter II, and the Final Fantasy series. Total worldwide sales of the SNES reached 49.10 million units, eclipsing the estimated 40 million unit sales of the Genesis. As the SNES battled the Sega Genesis, Nintendo was running into problems on another front caused by their own aggressive marketing behavior. In 1991, Nintendo agreed to a settlement regarding price-fixing allegations brought by the Federal Trade Commission and attorneys general in New York and Maryland. Nintendo had been accused of threatening to cut off shipments of the NES to retailers who discounted the price of the system. The estimated cost of the settlement was just under $30 million. In 1992, Gunpei Yokoi and the rest of R&D 1 began planning on a new virtual reality console to be called the Virtual Boy. Hiroshi Yamauchi also bought majority shares of the Seattle Mariners in 1992. By May 1993, Nintendo had reportedly become one of the top ten leading companies in the world. In 1993, Nintendo announced plans to develop a new 64-bit console codenamed Project Reality that would be capable of rendering fully 3D environments and characters. In 1994, Nintendo also claimed that Project Reality would be renamed Ultra 64 in the US. The Ultra 64 moniker was unveiled in arcades on the Nintendo branded fighting game Killer Instinct and the racing game Cruisin' USA. Killer Instinct was later released on the SNES. Soon after, Nintendo realized they had mistakenly chosen a name for their new console that the Konami corporation owned the rights to. Specifically, only Konami would have the rights to release games for the new system called Ultra Football, Ultra Tennis, etc. Therefore, in 1995 Nintendo changed the final name of the system to the Nintendo 64, and announced that it would be released in 1996. They later showed previews of the system and several games, including Super Mario 64, to the media and public. 1995 is also the year that Nintendo purchased part of Rare. In 1994, after many years of Nintendo's products being distributed in Australia by Mattel since the NES in 1985, Nintendo opened its Australian headquarters and its first Managing Directors were Graham Kerry, who moved along from Mattel Australia as Managing Director and Susumu Tanaka of Nintendo UK Ltd.
On June 23, 1996, the Nintendo 64 (N64) was released in Japan, selling over 500,000 units on the first day of its release. On September 29, 1996, Nintendo released the Nintendo 64 in North America, selling out the initial shipment of 350,000. Many feel that the advertising onslaught by Sony at this time did not truly begin to take effect until many of the consumers who held out for the N64 became frustrated at the lack of software following the first few months after the system's release. What also greatly contributed to the extremely competitive climate that Nintendo was entrenched in was the fact that many third-party companies immediately began developing and releasing many of their leading games for Nintendo's competing consoles. Many of those third party companies cited cheaper development and manufacturing costs for the CD format, versus the cartridge format. On December 1, 1999, Nintendo released an add-on to the Nintendo 64 in Japan, titled the Nintendo 64DD, although it was never released elsewhere. Nintendo followed with the release of the Game Boy Pocket, a smaller version of the original Game Boy, designed by Gunpei Yokoi as a parting gift. A week after the release of the Game Boy Pocket, Gunpei resigned from his position at Nintendo. Gunpei helped in the creation of a competitor system named the WonderSwan, using the skills he gained in the creation of the Game Boy. In 1996, Pocket Monsters (known internationally as "Pokémon") was released in Japan to a huge following. The Pokémon franchise, created by Satoshi Tajiri, was proving so popular in America, Europe, and Japan, that for a brief time, Nintendo took back their place as the supreme power in the games industry. In 1997, Game Boy and Metroid creator Gunpei Yokoi died in a car accident at the age of 56. On October 13, 1998, the Game Boy Color was released in Japan, with releases in North America and Europe a month later. Nintendo released the Game Boy Advance in Japan on March 21, 2001, followed by the North American launch on June 11 and the European launch on June 22. Nintendo released the GameCube home video game console on September 14, 2001, in Japan. It was released in North America on November 18, 2001, Europe on May 3, 2002, and Australia on May 17, 2002. In January 2002, Minoru Arakawa resigned as president of Nintendo of America, and Nintendo named Tatsumi Kimishima as his successor. In May 2002, Hiroshi Yamauchi stepped down as the president of Nintendo and named Satoru Iwata his successor. During the same year, Nintendo and Chinese-American scientist Dr Wei Yen co-founded iQue to manufacture and distribute official Nintendo consoles and games for the mainland Chinese market under the iQue brand. Nintendo's aggressive business tactics in Europe would catch up to them. The European Commission determined that Nintendo had engaged in anticompetitive price-fixing business practices dating at least as far back as the early 1990s. This resulted in a heavy fine being laid against the company — €149 million, one of the largest antitrust fines applied in the history of the commission. In May 2004, Nintendo announced plans to release a new brand of handheld, unrelated to the Game Boy, featuring two screens, one of which was touch-sensitive. The Nintendo DS, released on November 21, 2004, received over three million pre-orders. In addition to the touch screen, the DS can also create three-dimensional graphics, similar to those of the Nintendo 64, although its lack of hardware support for texture filtering results in more pixelated graphics than on the Nintendo 64. President Satoru Iwata reassigned all of Nintendo's software designers under new managers and different division; most of the resources were allocated to Shigeru Miyamoto and Takashi Tezuka and the Nintendo EAD division. On May 14, 2005, Nintendo opened its first retail store accessible to the general public, Nintendo World Store, at the Rockefeller Center in New York City. It consists of two stories, and contains many kiosks of GameCube, Game Boy Advance, and Nintendo DS games. There are also display cases filled with things from Nintendo's past, including Hanafuda, Nintendo's first product. They celebrated the opening with a block party at Rockefeller Plaza. At E3 in May 2005, Nintendo displayed the first prototype for their "next-generation" system, codenamed the Nintendo Revolution (now known as the Wii), its controller revealed at the Tokyo Game Show later that year. On January 26, 2006, Nintendo announced a new version of their Nintendo DS handheld, the Nintendo DS Lite, designed to be smaller and lighter, with a brighter screen. It was launched in Japan on March 2, 2006, and three months later in North America and Europe on June 11 and June 23, 2006, respectively. On May 25, 2006, Reggie Fils-Aimé was promoted to President and COO of Nintendo of America, Inc. The former President, Tatsumi Kimishima, was promoted to Chairman of the Board and CEO. On July 7, 2006, Nintendo officially established a South Korean subsidiary, Nintendo Korea, in the country's capital, Seoul, which replaced Daewon Media as the official distributor of Nintendo products in South Korea. In early August 2006, it was revealed that Nintendo, along with Microsoft, was made the target of a patent-infringement lawsuit. Leveled by the Anascape Ltd., the suit claimed that Nintendo's use of analog technology in their game controllers constitutes a violation of their patents. The lawsuit sought to recover damages from both corporations and possibly force them to stop selling controllers with the violating technology. Microsoft settled with Anasacape, while Nintendo went to trial, initially losing and being ordered to pay US$21 million in damages. Nintendo appealed, and on April 23, 2010 the Federal Circuit reversed the ruling. In November 2010, Anascape's appeal to the Supreme Court of the United States was denied. 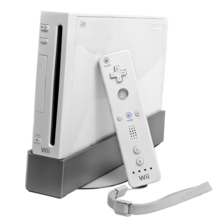 In mid-September 2006, during press conferences held in Tokyo, New York, and London on 13, 14 and 15 September, respectively, Nintendo announced launch details for its Wii console, as well as demonstrated features of the "Wii Menu" GUI. The system was first released on November 19, 2006 in the US, followed by the Japanese launch on December 2, the Australian launch on December 6, and the European launch on December 8. The console sold fast and was a big breakthrough for Nintendo, picking up the pace lost from their last console, the GameCube. The success of the Wii has been attributed to the intended market of the product; while at the time most competitors were focusing on more adult and fan-based games, Nintendo decided to release a console for a larger demographic, one including casual gamers, children and those who wouldn't ordinarily play video games. Since no other major gaming console was marketing for this image, these other companies were caught mostly unprepared by the success of the Wii system, and it wasn't until 2010 that Sony and Microsoft released consoles targeting the same demographic as the Wii. On September 17, 2007, Nintendo of America closed its official forums, the NSider Forums, indefinitely due to a major overhaul of their site. For months prior, cutbacks in Nintendo of America's online department led to the trimming back of NSider's chat hours and the replacement of their annual Camp Hyrule event — held during August — with a sweepstakes. In the meantime, Nintendo encouraged fans to run their own forums. Nintendo-Europe's forum section of their site was also officially closed down a week later due to a site revamp, however it had been offline citing "security issues" since June of that year. On December 19, 2007, Nintendo opened a forum for technical support only. In October 2007, Nintendo announced Nintendo Australia's new Managing Director, Rose Lappin. She is Nintendo's first female head of one of its subsidiaries and worked for Nintendo before it started in Australia as Director of Sales and Marketing for Mattel and had that role until she was announced Managing Director. On November 1, 2008, Nintendo released an updated version of the Nintendo DS Lite in Japan; the Nintendo DSi. It includes all features of the Nintendo DS Lite, but it includes a camera on the inside and outside of the system, and newer features. It is the first handheld game system manufactured by Nintendo that allows downloadable gaming content to the system. The Nintendo DSi was released April 2, 2009, in Australia and Asia, April 3, 2009, in Europe, and April 5, 2009, in North America. On February 26, 2011, the Nintendo 3DS was released in Japan. It was released on March 25 and 27 to Europe and the US, respectively. The 3DS was part of a large wave of 3D technologies being released at the time; unlike most of these, the 3DS did not use 3D glasses for its 3D effect, and instead used parallax barrier autostereoscopy. On April 25, 2011, Nintendo confirmed that they were making a new console to be released in 2012. On June 7, 2011, the console was announced as being named the Wii U. The Wii U is Nintendo's first console to be able to play video games in 1080p HD. During the Electronics Entertainment Expo in 2011, Nintendo's press conference put a great amount of stress on the abilities and innovations of the new controller, a unit resembling a tablet. Many gamers were confused after the press conference about whether the Wii U is an entirely new system or just a new controller for the Wii. The Wii U was, however, a whole new home console system developed by Nintendo. The system was released on November 18, 2012 in North America, November 30, 2012 in Europe and Australia, and on December 8, 2012 in Japan. It featured a new controller with a 6.2 inch touchscreen, two thumb pads, four shoulder buttons, a directional pad, and four lettered buttons. It also featured an accelerometer, gyroscope, camera, Near-field communications (NFC), and built-in microphone, similar those in the Nintendo 3DS. The Nintendo Switch Console in the Dock with Red and Blue Joy-Con controllers. On July 11, 2015, Satoru Iwata died from a bile duct tumor at the age of 55. Following his death, Shigeru Miyamoto and Genyo Takeda jointly led the company on an interim basis until Tatsumi Kimishima's appointment as Iwata's successor on September 16, 2015. In addition to the appointment, Miyamoto was named "Creative Fellow" while Takeda was named "Technology Fellow". ^ "Nintendo Trademark". Archived from the original on 2010-10-29. ^ ""Nintendo" Might Not Mean What You Think". Gizmodo. Retrieved 2013-05-08. ^ "Nintendo History". Nintendo.co.uk. Retrieved 17 December 2014. ^ "Profile: Hiroshi Yamauchi". N-Sider.com. Retrieved 17 December 2014. ^ a b "Nintendo History Lesson". N-Sider.com. Retrieved 17 December 2014. ^ a b c d "Company History". Nintendo.co.jp. Retrieved 17 December 2014. ^ Kohler, Chris (23 September 2010). "Sept. 23, 1889: Success Is in the Cards for Nintendo". Wired.com. Wired. Retrieved 17 December 2014. ^ Ashcraft, Brian (22 March 2011). "The Nintendo They've Tried to Forget: Gambling, Gangsters, and Love Hotels". Kotaku. Retrieved 17 December 2014. ^ Kohler, Chris (20 September 2013). "Hiroshi Yamauchi, man who built Nintendo's gaming empire, dies at 85". Wired.co.uk. Archived from the original on 18 December 2014. Retrieved 18 December 2014. ^ a b Pollack, Andrew (9 October 1997). "Gunpei Yokoi, Chief Designer Of Game Boy, Is Dead at 56". The New York Times. Retrieved 17 December 2014. ^ Voskuil, Erik (20 February 2011). "Nintendo Light-beam games Kôsenjû SP and Kôsenjû Custom (光線銃SP, 光線銃 カスタム 1970-1976)". Before Mario. Retrieved 17 December 2014. ^ Voskuil, Erik (1 February 2014). "What does the Nintendo Ele-conga sound like?". Before Mario. Retrieved 17 December 2014. ^ a b c "Nintendo: Company History". Archived from the original on 5 February 1998. Retrieved 18 December 2014. ^ "Nintendo Power". Nintendo. Archived from the original on 6 December 2012. Retrieved 4 December 2012. ^ a b "Hardware and Software Sales Units". Nintendo.co.jp. Retrieved 17 December 2014. ^ "Chronology of Nintendo Video Games (1988-1989)." Chronology of Nintendo Video Games (1988-1989). N.p., n.d. Web. 07 Aug. 2015. ^ Craig Glenday, ed. (2008). Guinness World Records Gamer's Edition 2008. Guinness World Records. section coauthored by Oli Welsh. Guinness World Records Limited. p. 110. ISBN 978-1-904994-20-6. ^ Shapiro, Eben (1 June 1991). "Nintendo Goal: Bigger-Game Hunters". The New York Times. Retrieved 17 December 2014. ^ "History | Corporate". Nintendo. Retrieved 18 December 2014. ^ Retro Gamer staff (2013). "Sonic Boom: The Success Story of Sonic the Hedgehog". Retro Gamer — The Mega Drive Book. London, UK: Imagine Publishing: 31. The game and its star became synonymous with Sega and helped propel the Mega Drive to sales of around 40 million, only 9 million short of the SNES—a minuscule gap compared to the 47 million that separated the Master System and NES. ^ "Nintendo Price-Fixing Case Settled". Seattle Times. 1991-04-11. Retrieved 2011-08-10. ^ "Yamauchi Buys Mariners As A Public Service". The Spokesman-Review. Associated Press. 1992-06-11. Retrieved 2014-12-17. ^ "Nintendo Of America President Retires, Replaced By Pokemon USA Exec". Gamasutra. 8 January 2002. Retrieved 19 February 2015. ^ Walker, Trey (24 May 2002). "E3 2002: Yamauchi steps down". GameSpot. Retrieved 17 December 2014. ^ "Nintendo to Enter China's Video-Game Market With a New Console". Bloomberg.com. 25 September 2003. Retrieved 18 December 2014. ^ "Nintendo fined for price fixing". BBC News. 2002-10-30. Retrieved 2007-03-11. ^ Dobson, Jason (2006-05-25). "Nintendo Of America's Fils-Aime Promoted to President/COO". Gamasutra. Think Services. Retrieved 2009-12-14. ^ Jenkins, David (30 June 2006). "Nintendo Establishes Subsidiary In South Korea". Gamasutra. Retrieved 18 December 2014. ^ "Nintendo, Microsoft Face Patent Lawsuit - DS News at IGN". Web.archive.org. 2009-01-26. Archived from the original on 2009-01-26. Retrieved 2012-10-31. ^ Ricker, Thomas (15 May 2008). "Nintendo ordered to pay $21 million to patent troll". Engadget. Retrieved 17 December 2014. ^ Kapur, Rajit (4 April 2010). "Case Update: Anascape, Ltd. v. Nintendo of America Inc". Patent Arcade. Retrieved 17 December 2014. ^ Greenspan, Jesse (1 November 2010). "Anascape Bid To Reclaim $21M Dashed By High Court". Law360.com. Retrieved 17 December 2014. ^ "Wii European launch details announced". GamesIndustry.biz. 15 September 2006. Retrieved 18 December 2014. ^ Gaudiosi, John (25 April 2007). "The untold story of how the Wii beat the Xbox, PlayStation". CNN.com. Retrieved 18 December 2014. ^ Stan Schroeder, Mashable (25 April 2011). "Nintendo confirms Wii successor for 2012". CNN.com. Retrieved 2012-10-31. ^ "WiiU Price and Release Date Announced". WiiU News. 2012-09-13. Retrieved 2012-09-13. ^ "Nintendo Network @ E3 2011 - Introducing Wii U". Web.archive.org. 2011-06-15. Archived from the original on 2011-06-15. Retrieved 2012-10-31. ^ "Notice Regarding Personnel Change of a Representative Director and Role Changes of Directors" (PDF). Nintendo. September 14, 2015. Retrieved September 14, 2015. ^ "Awards - The Game Awards". The Game Awards. Retrieved 2018-01-23. Sheff, David (1993). Game Over: How Nintendo Zapped an American Industry, Captured Your Dollars, and Enslaved Your Children. New York, New York: Random House. ISBN 0-7881-6320-5. Gorges, Florent; Isao Yamazaki (2010). The History of Nintendo: 1889-1980 From playing-cards to Game & Watch. Paris, France: pix'n love publishing. ISBN 2-918272-15-9.